This line of scanners was discontinued by Kodak Alaris in 2016. 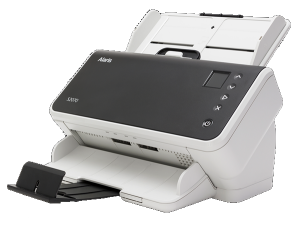 With an unlimited daily duty cycle, the Ngenuity Scanners breeze through documents up to 12.5 inches wide and 200 meters long, at speeds that are among the best in their class. 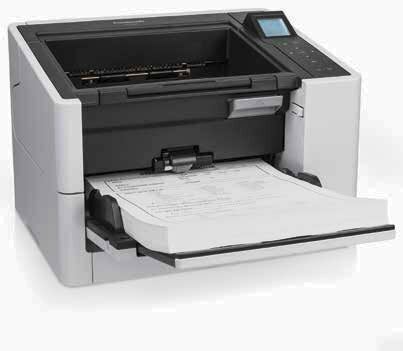 While most documents can make their way easily through the scanner’s rotary path, the Ngenuity Scanners include an alternative “straight pass through” paper path for exception documents (such as stuffed envelopes and laminated cards) that cannot make the turn on the rotary path. 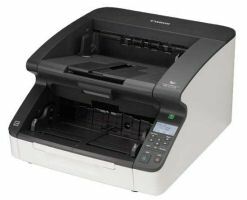 What’s more, special document scanning modes auto-adjust the Ngenuity Scanners’ feeding and transport scanner settings for very long, folded or fragile documents. The Ngenuity Scanners’ feeder tray holds 700 documents—40% more than other scanners in their class. The tray also rises and falls—literally—in perfect sync with your batch size, thanks to Variable Feeder Tray Capacity Control, which remembers your most recent batch size. And since the feeder does not restrict you to manufacturer-set batch size limitations, you can scan almost any size batch you want, faster than ever before. Armed with top-of-the-line Sharp Shooter Tri-linear CCD cameras, the Kodak Ngenuity Scanners deliver 600 dpi optical capture and output. This advanced camera technology delivers higher OCR, ICR and barcode recognition rates and more reliable forms processing. The Ngenuity Scanners feature a USB 2.0 port and cable to make it easier for you to connect the scanner to the PC. They have a SCSI-III port as well. You can access much of the scanner functionality directly through the PC. For example, the Ngenuity Operator Utility (NOU) allows you to track the total number of scans and monitor maintenance schedules. Further, our user-friendly interface with front panel functionality provides easy access to frequently used features and includes two user- customizable function buttons. Three independently controlled, ultrasonic sensors raised the bar on multi-feed detection. What’s more, the “Multi-feed Ignore” setting on the Ngenuity Scanners now allows you to accept scanned images and continue scanning or alert the scanner in advance to accept an intended multi-feed. The “Ignore by Size option lets you proactively scan items—such as taped receipts and sticky notes—that the scanner might otherwise identify as a multi-feed and stop. The Ngenuity Scanners’ steel paper path and durable parts (including protectively sealed CCD cameras, long-lasting LED lights, and rollers that last for 600,000 scans) ensure that the scanners are able to withstand the many challenges of any hardworking production environment. This yields a low, overall cost of scanner maintenance and ownership. Ngenuity Scanners are also easy to clean and maintain. The scanners’ only consumables—the rollers and tires—are easy to replace; and users can install optional accessories like the imprinter, easily. With ultrasonic technology, three sensors, Preemptive ignore, Ignore As Is, Ignore by size.